Be it guns or global warming, a fascinating trend is unfolding in the Trump era: Corporations, under intense social pressure, are filling a void left by governmental gridlock or avoidance. In most cases, this phenomenon is inspired not by the pure benevolence of corporations. Instead, it’s intense pressure from social media mobs and idealistic millennials in the companies’ workforces, who expect their employers to take stands. Issues where companies are suddenly taking stands include immigration, harassment and #MeToo, and LGBT discrimination. "Corporate social responsibility" (shorthanded as "CSR" within companies) is now one of the hottest topics in boardrooms. Trump gets credit for speeding up, if not inspiring, this new era of corporate action. After all, it was his early "travel ban" that forced CEOs to start speaking out. This new, more vocal form of corporate activism soon spread to global warming, immigration, the minimum wage and now gun control. Why it matters: Top corporate officials tell us this phenomenon will become integrated into corporate culture and therefore have staying power. The backdrop: A similar civic wave started post 9/11, with increased respect for military reserve duty and National Guard call-up. It waned under the pressure of the post-2008 recession, returning with marriage equality. And now it's cresting in the era of Trump’s anti-establishment populism. The big picture: The social compact between private enterprise, government and citizens has permanently changed. When Trump took office, several studies (AdAge, 4A’s) suggested that wading into political and societal issues proved risky for brands. Now, consumers are looking for brands to take stands on societal issues: 66% of consumers find it important for brands to speak out on socio-political issues like gun control, according to new data from Sprout Social. 58% of millennials, 55% of GenXers and 51% of baby boomers think it’s important that brands they support invest in causes they care about, according to a report from InMoment released Wednesday. Twitter quickly verified (blue check mark) student survivors of the Stoneman high school massacre. Students like David Hogg and Emma Gonzalez have become household names, with 200,00 and 500,000 Twitter followers, respectively. Nonprofits are taking to social media to encourage media and tech companies to block NRA ads. #BoycottNRA was the number one trending topic on Twitter Friday in the United States. Axios' Dan Primack notes that social media has turned local issues and corporate connections into global ones. Companies have long supported their local communities, from sponsoring youth sports leagues to giving scholarships to high school grads, because that's where executives had their touch points. But now a CEO in Miami is instantly connected to a random citizen in Seattle. Another engine ... Fossil-fuel companies are being driven less by pressure from social media or millennials and much more by activist investors urging responsibility and disclosure, Axios' Amy Harder points out. One Wall Street executive's thought bubble, via email: "Companies respond to reputational risk aggressively. Activist shareholders, public pressure from customers amplified through social media, and business press all combine to move corporate leadership to engage on issues to protect brands." "These risks cannot be mitigated using traditional risk management tools such as insurance and financial instruments. Corporate leaders have to speak out and act to keep these risks from impacting performance." But, but, but ... Even though businesses have the opportunity to fill a leadership void, Axios' Kim Hart points out that not everyone thinks business leaders can be trusted to do so. A recent Public Affairs Council / Morning Consult poll found only 47% of Americans trust major companies to behave ethically. Only 9% of Trump voters and 8% of Clinton voters give CEOs high scores for honesty. They not only have to focus on balance sheets and issues that directly impact their bottom lines, but now are expected to take stands on social issues and be more "mission-oriented." Be smart: These are corporate policies and pronouncements, not laws. They can be easily undone when public attention abates. After Sandy Hook, a number of big retailers removed AR-style rifles from shelves, but the weapons have since returned. Several corporate managers have told us privately they resent directing money and attention for social causes, instead of driving profit and business growth. President Trump said last night that he's aiming for Veterans Day, in November, for a military parade "up and down Pennsylvania Avenue" with "a lot of plane fly-overs." Trump said in a phone interview with Fox News' Judge Jeanine Pirro: "We are talking about probably Veterans Day," which is Sunday, Nov. 11 (with the federal holiday on Monday, Nov. 12). As an alternative, Trump said, "I like July 4, because July 4 in Washington D.C. would be beautiful." White House Budget Director Mick Mulvaney said this month that such a parade could cost $10 million to $30 million. As his inspiration, Trump said: "I was at the Bastille Day Parade in France with the president of France [Emmanuel Macron] — very good guy." "I think it's great for spirit. The military loves it — they love the idea. We would have West Point and Annapolis, and the Air Force Academy, Coast Guard Academy. 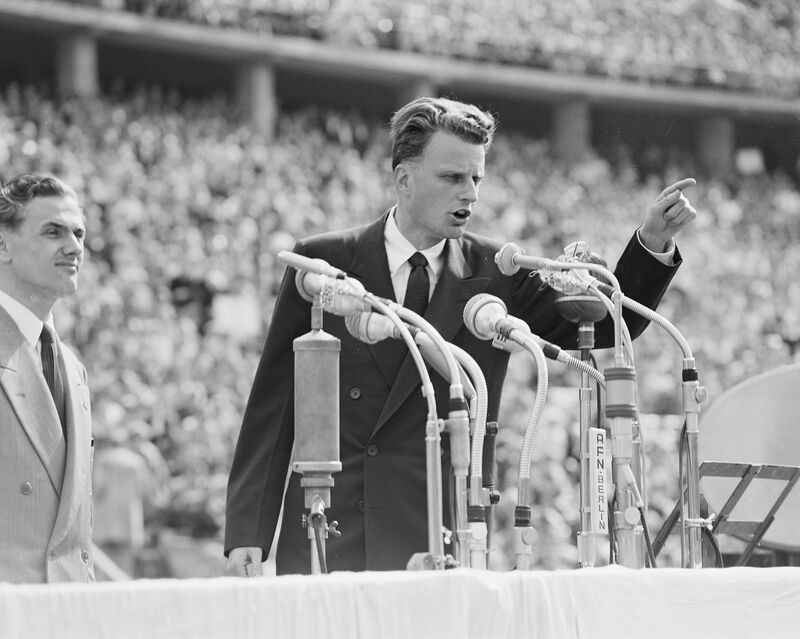 ... We have a great country and we should be celebrating our country." "So, we'll see if we can do it at a reasonable cost. And if we can't, we won't do it. But the generals would love to do it, I can tell you, and so would I. I think it's great for our country in terms of being a cheerleader and the spirit. It's very important." Democrats' rebuttal memo on the Russia investigation, released in a redacted version yesterday, says that contrary to claims in Republicans' memo, the FBI and Justice Department "did not 'abuse' the [FISA] process, omit material information, or subvert this vital tool to spy on the Trump campaign." Why it matters, from Axios' Haley Britzky: These memos have taken on a role in the inter-party battle over Russia that is disproportionate to what they actually contain. "[A] lot of bad things happened on the other side ... and somebody should look into it. Because what they did is really fraudulent and somebody should be looking into that. And by somebody, I'm talking about you-know-who." Trump tweets ... "Dem Memo: FBI did not disclose who the clients were - the Clinton Campaign and the DNC. Wow!" "The overtly political 2018 Winter Olympics closed Sunday night very much as they began, with humanity's finest athletes marching exuberantly across the world stage as three nations with decades of war and suspicion among them shared a VIP box — and a potential path away from conflict." 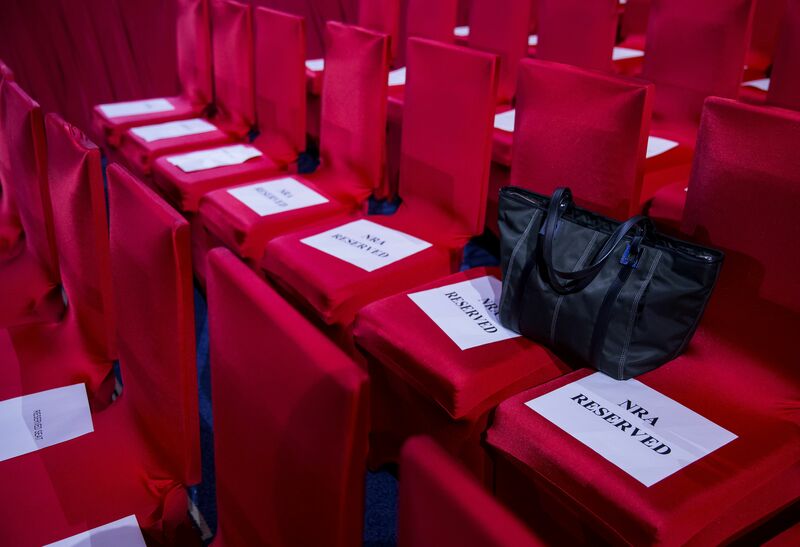 "Senior North Korean official Kim Yong Chol, South Korean President Moon Jae-in and U.S. presidential adviser and first daughter Ivanka Trump sat in two rows of seats behind the Olympic rings, meant to represent a competition of peace and international unity." 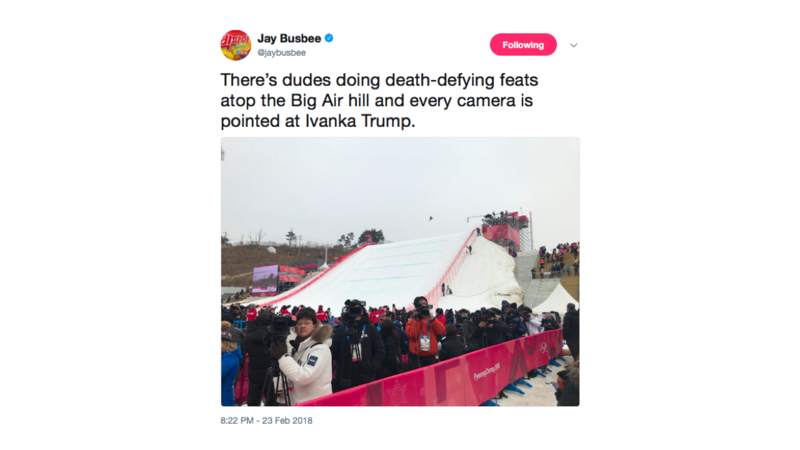 "In close proximity — though with no apparent communication between Trump and Kim — they watched a spirited, elaborate show that concluded the Pyeongchang Games." Ivanka Trump said her visit to the Olympics was "so incredibly inspiring" and expressed gratitude at the chance to watch competition and — in a subtle nod to Korean Peninsula politics — "be here with our allies in South Korea." "BulletBlocker, a company that sells bulletproof backpacks ranging in price from $199 for a girly pink one to $490, has seen sales jump 300 percent since the Florida shooting." A $95 metal device called “JustinKase,” which is placed under a door and latches to the door’s jamb to prevent entry, was invented by a 17-year-old Wisconsin high school student, Justin Rivard. Bite of the Day ... President Trump to Fox News' Judge Jeanine Pirro: A gun-free zone around a school is "like target practice for these guys. ... Gun-free zones are very dangerous because bad guys loved gun-free zones." "We've got 321 days of focus — not to say that my wife and I don't occasionally have discussions, but we're focused on getting things done." On what his wife, Robin Pringle, thinks of his running for president: "She thinks it's hilarious. [Laughter] But ... she also thinks it's interesting. So, we'll see what those discussions — where they go." “We may be beginning to see the end of a two-party system." The motorcade carrying the body of the Rev. Billy Graham to Charlotte's Billy Graham Library rolled through the shopping district in Black Mountain, N.C., yesterday. Graham often shopped or caught trains in Black Mountain. 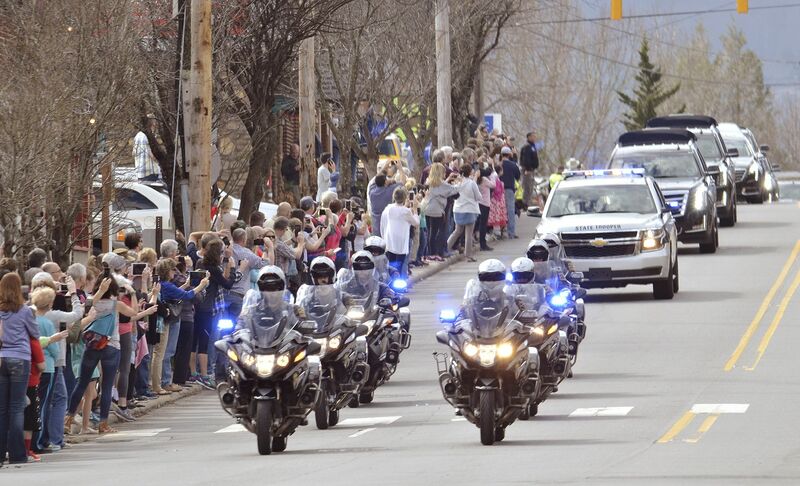 The procession is part of more than a week of mourning that culminates with his burial Friday at his library in Charlotte. Graham will "lie in honor" in the Capitol Rotunda on Wednesday and Thursday, March 1, the Speaker's office announced. Upon the arrival of the casket, Speaker Ryan and Senate Majority Leader Mitch McConnell will take part in a bicameral service. Graham website with memorial details. 8. Worst week in the world: Tie! This is the booking photo of Missouri Gov. Eric Greitens (R), who was indicted on a felony invasion of privacy charge for allegedly taking a compromising photo of a tied-up woman with whom he had an affair in 2015. And this is Canadian Prime Minister Justin Trudeau, who was mocked at home and around the world for his attire while visiting India. Here, Trudeau and his wife, Sophie Gregoire Trudeau — with their son, Xavier, and daughter, Ella-Grace — pay obeisance at the Golden Temple in Amritsar, Punjab, India. 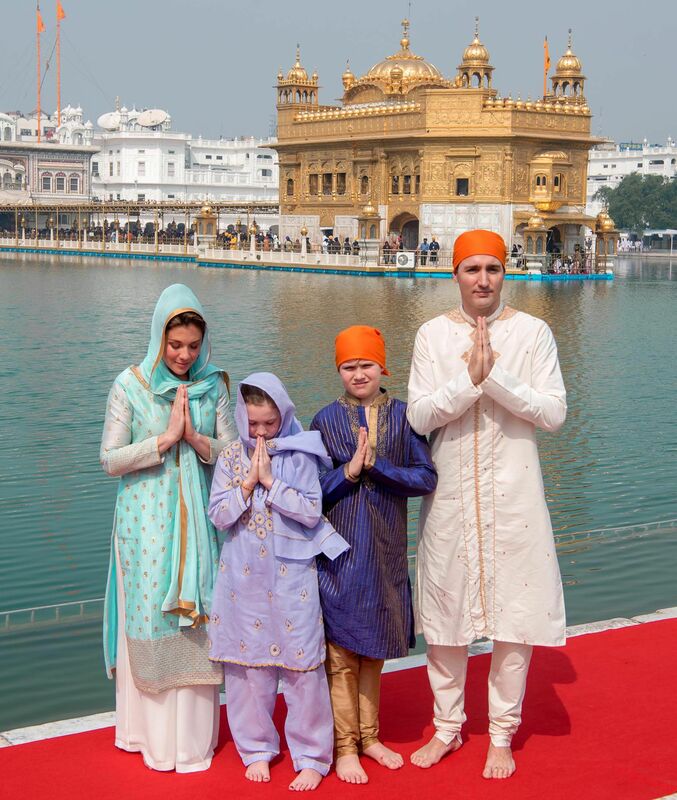 After offering prayers inside the temple, the Trudeaus attended the traditional langar or community meal and performed kar seva at the Golden Temple's community kitchen. "They say that death comes like a thief in the night. ... The affliction that stole my vision, or at least a big chunk of it, did so as I slept. I went to bed seeing the world one way. I woke up seeing it another." "This was about four months ago ... I ... experienced what is colloquially called 'a stroke of the eye,' whereby the optic nerve is ravaged by a brief reduction of blood flow and thus oxygen." "The name for this condition is nonarteritic anterior ischemic optic neuropathy (N.A.I.O.N. ), and it afflicts perhaps one in 10,000 Americans." "This tends to occur after the age of 50. (I’m 53.)" "There was nothing I could do — no diet, no exercise, zilch — to influence the outcome." "[I]n the middle of the night, when my bladder screamed, I hesitated before opening my eyes." "For the moment my handicaps are minor. ... My typos have multiplied. My texting is a joke." "I found myself taking inventory of the obstacles and upsets that people I knew were dealing with. There were children with autism. Parents with Alzheimer’s. Financial crises. Career disasters. Addiction. Abuse." Why it matters: "How much else lurked beneath the surface? Show me someone with a seemingly unbroken stride and unfettered path. More often than not, he or she is hampered and haunted in ways that you can’t imagine." 10. 🏀 1 hoop thing: "Payroll! Payroll!" One of more than two dozen names mentioned as receiving impermissible benefits, in documents in a Yahoo Sports report Friday, was former Wichita State guard Fred VanVleet, now with the NBA's Toronto Raptors. The investigation has led to 10 arrests of coaches and others. Several players singled out in the report played yesterday. 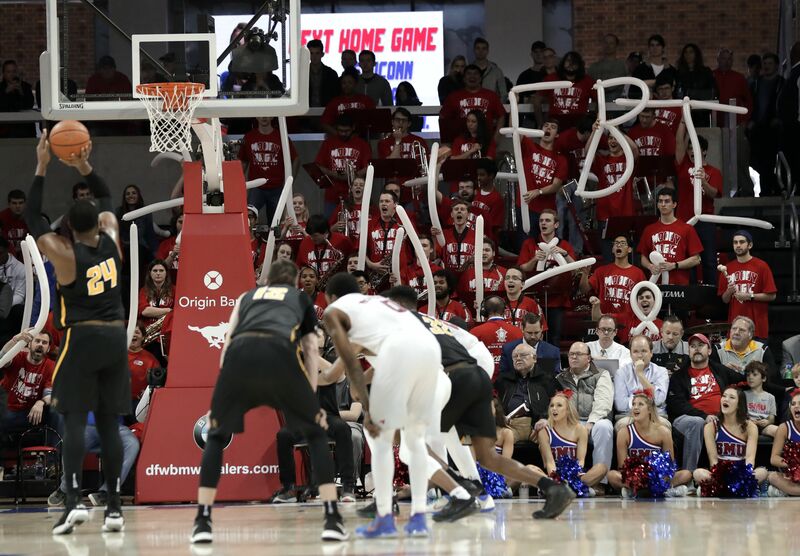 Utah's student section mocked Southern California forward Chimezie Metu, who was mentioned in Yahoo's report but scored 14 points to lead the Trojans in a win. The Utah fans displayed signs like "Need Money? Metu! (Me too)" and chanted, "Payroll! Payroll!" whenever he had the ball or returned to the bench. At Arizona, Wildcats recruit Shareef O'Neal, son of former NBA star Shaquille O'Neal, withdrew his commitment after ESPN reported coach Sean Miller was heard on a wiretap discussing a $100,000 payment to freshman Deandre Ayton to get him to sign with the school. Go deeper ... Yahoo Sports, "Black market diaries: Emails in hoops corruption case detail inner workings of sport's underbelly."